Cork’s elasticity combined with its near-impermeability makes it suitable as a material for bottle stoppers, especially for wine bottles. Cork stoppers represent about 60% of all cork based production. Cork’s low density makes it a suitable material for fishing floats and buoys, as well as handles for fishing rods (as an alternative to neoprene). Sheets of cork, often the by-product of more lucrative stopper production, are used to make floor tiles and bulletin boards. As late as the mid-1600s, French vintners did not use cork stoppers, using oil-soaked rags stuffed into the necks of bottles instead. Natural cork closures are used for about 80% of the 20 billion bottles of wine produced each year. 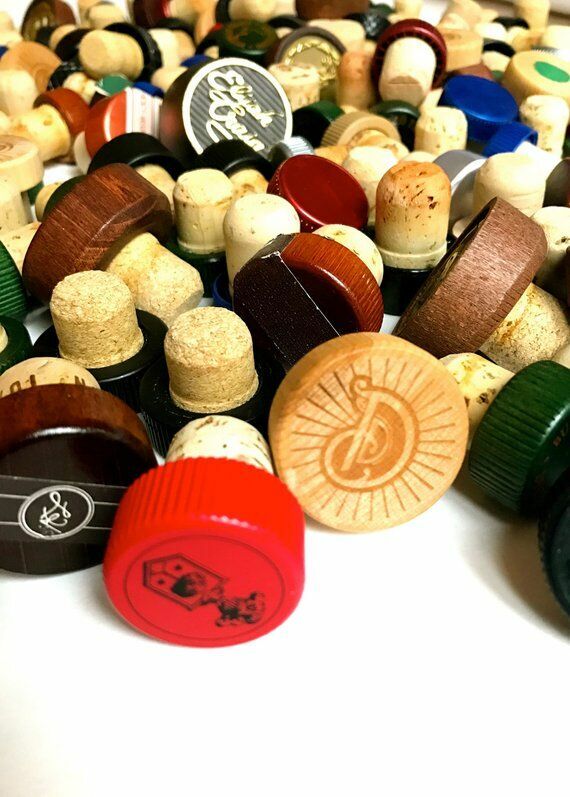 After a decline in use as wine-stoppers due to the increase in the use of cheaper synthetic alternatives, cork wine-stoppers are making a comeback and currently represent approximately 60% of wine-stoppers today. The use of cork for sealing bottles and other containers has a history spanning more than 2000 years; and is probably the best-known application of cork. Whether the bottles contain old vintage port, champagne, rare vintage wines, sherry, brandy, whiskey or natural mineral waters, the sealing agent must be air-tight, impermeable, resilient, odorless, tasteless, and resistant to deterioration through age or chemical activity. On all these counts, cork is the only ideal closure material. Corks can be manufactured in any shape or size to fit any kind of container, from the smallest to the largest. They are used not solely for bottles, but also for many other purposes, including the sealing of tiny museum specimen phials, pottery and glass storage jars, and as bungs for barrels. Composition cork is also used as a lining disc in metal or plastic screw caps. Enormous care is taken over the manufacture of that apparently simple object, the cork closure, which is probably one of the most vital factors in the successful maturing and sealing of wines and spirits. Natural cork is the only sealing material which allows wine to ‘live’ and mature in the bottle, the wine gradually improving as it ages. For vintage wines, the seal may need to last for decades, allowing each wine to develop its own distinctive subtleties of flavor and bouquet. Wine corks are made from specially selected corkwood, automatically cut into shape, washed, and minutely inspected for flaws. They may then be code branded to suit bottlers’ individual requirements, or to comply with EEC regulations. Usually, they are sterilized and moisture controlled before dispatch. Finished corks arrive at the bottlers’ premises packed in heat sealed polyethylene bags, clean, slightly lubricated and completely ready for use. For many applications, corks are fitted with plastic, wood, ceramic or glass tops. These ‘stopper corks’ can be attractively printed or embossed with special designs in different colors. They give an excellent reseal, and are mainly used for spirits, liqueurs and fortified wines. The design of seals for pressure beverages such as sparkling wines and carbonated drinks poses several problems. The main difficultly lies in finding a seal which will prevent the escape of gases and the consequent ‘flatness’ of the drink. For such duties, cork is superb, whether wired on to the container – as for champagne bottles – or used in the form of lining discs for metal caps. Because of the high percentage of suberin in cork tissue, cork cells are impermeable to liquids and gases. This, combined with compressibility and flexibility, guarantees cork’s position as a leading raw material in the bottling industry. The cork stopper can be traced back to ancient Egypt and Greece from Homeric times. But it was never very widely used until its reinvention in 1680 by the French Benedictine Dom Pierre Perignon, put cork to use in receptacles for sparkling wine. From then on it slowly, but surely, entered into general usage. The first corks were conical. Equipment capable of inserting under pressure cylindrical stoppers into bottles dates from 1830. Agglomerated cork, made from cork granules agglutinated with their own resin, first appeared in the United States of America in 1891. Three years later, Rheims (France), in the Champagne region, production started up of two-piece cork stoppers jointed with an ether based glue. The quest for a cheaper cork led to the production in 1903 of a cork stopper in two pieces, the lower part of better quality natural cork and the upper of cork agglomerate. In 1925, production started up of blocks of cork agglomerate, paving the way for the manufacture of cylindrical batons of granulated cork. From these the cork heads were then produced in series. There is thus a huge variety of cork stoppers: those made entirely of natural cork, in one or two pieces, those made from amadia and granulated cork, i.e. comprising an agglomerate head and one to three discs of natural cork, joined together as one piece. There is also a wide range of stopper types: corks inserted manually, under pressure, champagne corks, cylindrical and conical corks, etc. 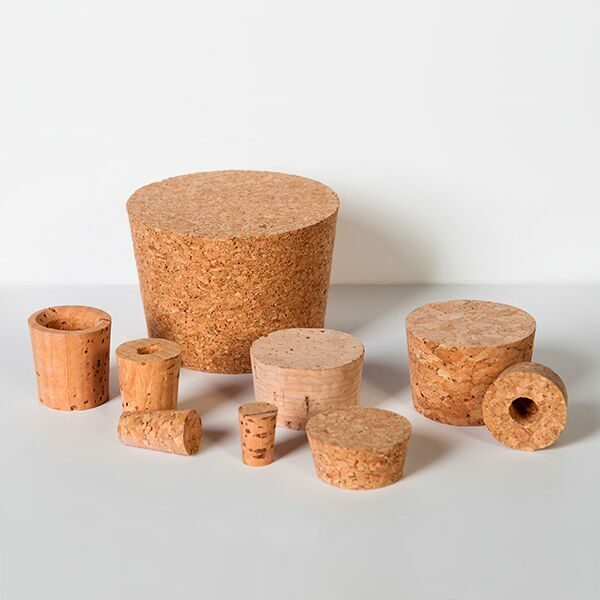 The cork stopper has undeniable advantages over its plastic or other synthetic equivalents, which are not elastic and are deformed by pressure and temperature. For this reason, wines stopped with such products lose their characteristic qualities. The cork stopper, on the other hand, does not age and retains unimpaired its intrinsic qualities over long periods of time. 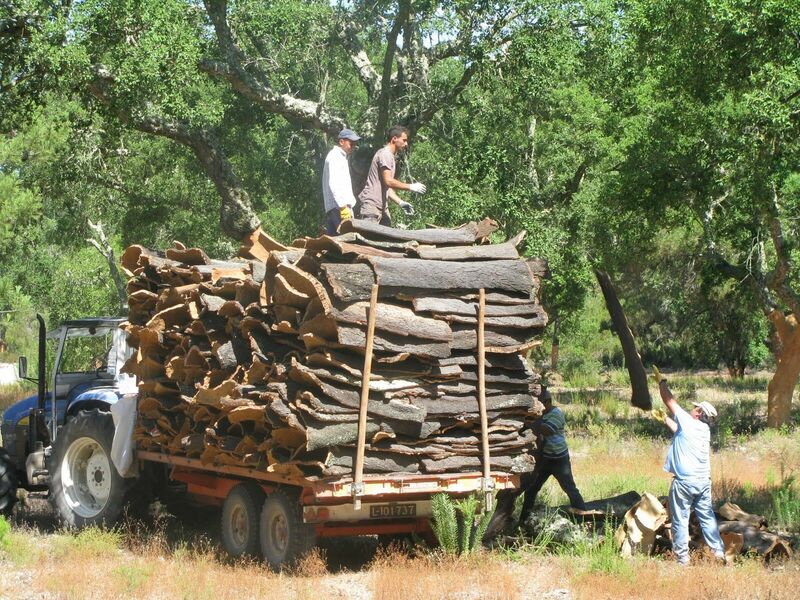 Cork is not only chemically inert, harmless to health and resistant to the ravages of time. It also maintains its natural elasticity, safeguarding a completely hermetic seal to the receptacle it serves. A cork stopper thus conserves the wine’s individual qualities and allows it to improve the age. Sparkling wine is a case in point. Here a cork is irreplaceable, being the only material which can be fashioned into a suitable stopper, a specially designed type of cork to maintain the gas pressure in the bottle and to stop the gas escaping. The lower part of the cork, in this case, consists of discs of natural cork glued one to the other. 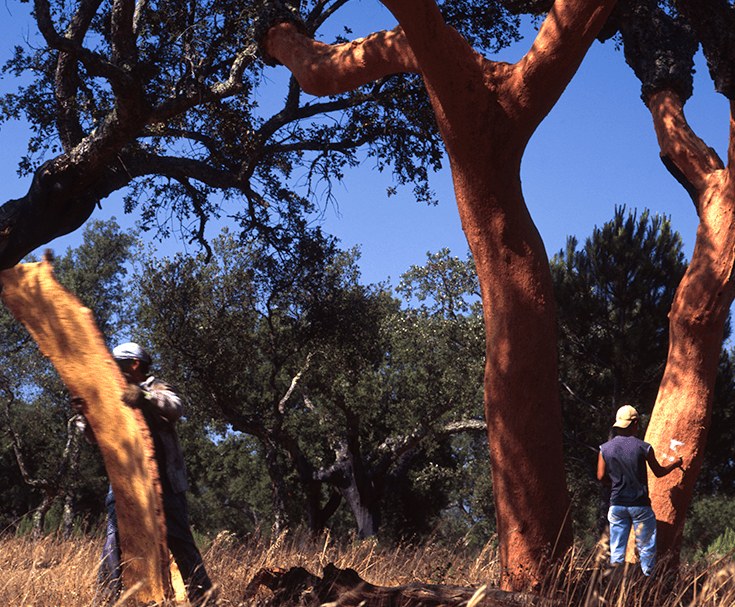 The upper part, also known as theor, is made from cork granules. The most modern technique is individual moulding, where the granules are submitted to uniform pressure. These same discs are also produced in a much smaller size for use in bottles for beer, water, soft drinks and water. MILLIONS of stoppers in stock and READY TO SHIP!